This is completely out of season, because it’s been ages and ages since the blog was updated. A broken camera and general business/laziness have led to poor RA being neglected. 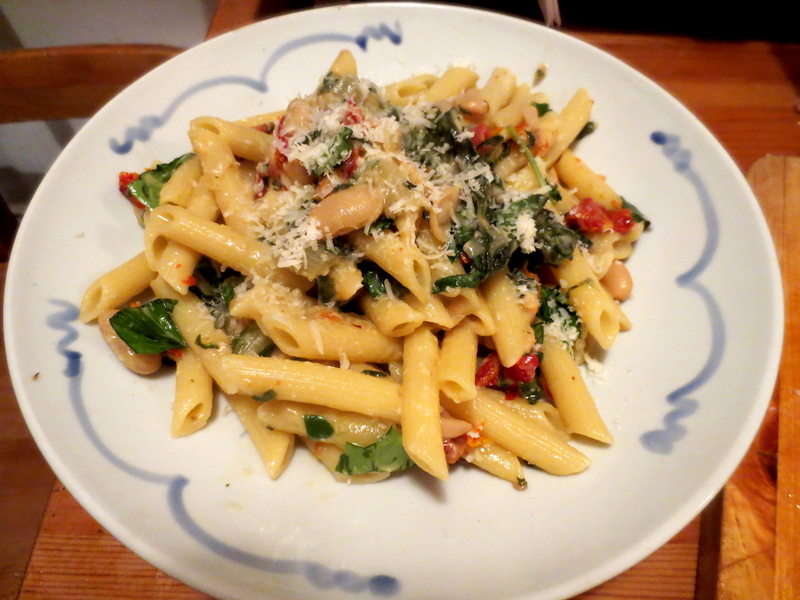 But we’ll try and do better, and in the meantime, here is an extremely comforting pasta that was great in the winter and will still be great now. 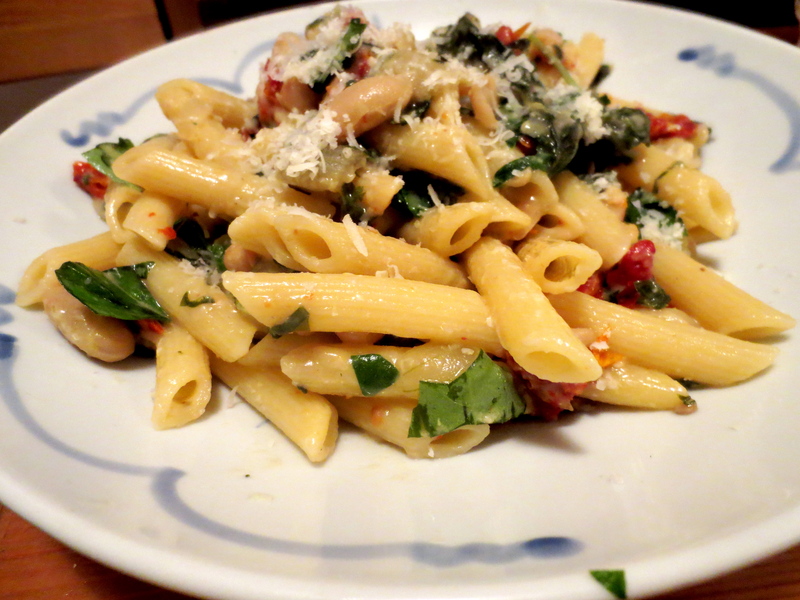 This is inspired by a dish I had at Osteria Stellina in Point Reyes Station on a little trip with my mom. We go up there relatively often as my mom likes to finish off her grueling semesters teaching high school English with a little relaxation at a B&B, and we always used to eat at the same restaurant, the amazing Olema Farmhouse Inn. But it closed sometime in the past year, and in search of a replacement (not that there are many choices in the tiny town) we tried this Italian place and it was completely amazing, in atmosphere, friendliness, and food–especially with this dish of flavorful braised greens, savory sundried tomatoes, rich creaminess from the white beans and cheese, and a bit of freshness in the end with the lemon juice and basil. Highly recommended! Sautee onions and garlic for five minutes until soft and translucent. 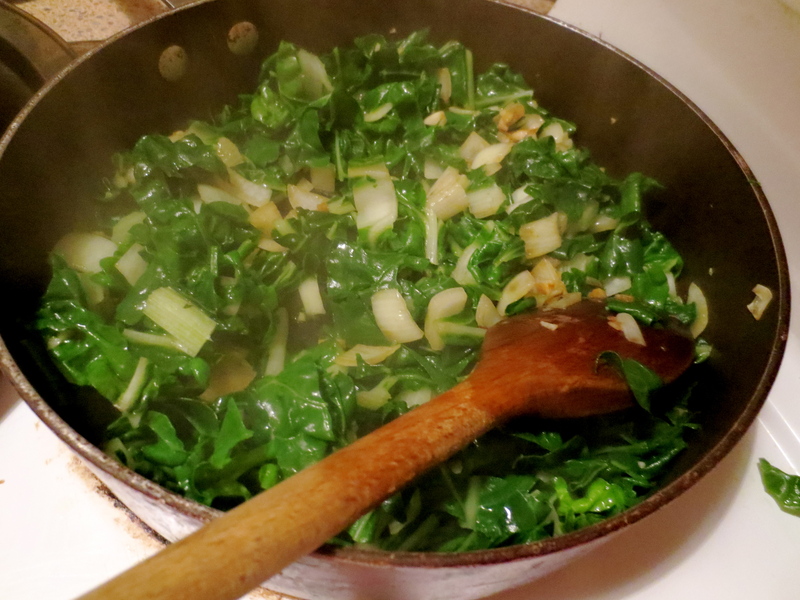 Throw in the chopped chard and sautee until bright green and just starting to wilt. Add broth and cover, simmering for 15-20 minutes. Start the pasta! Uncover and add white beans, stir well and keep on a high simmer, stirring frequently, to evaporate the liquid. 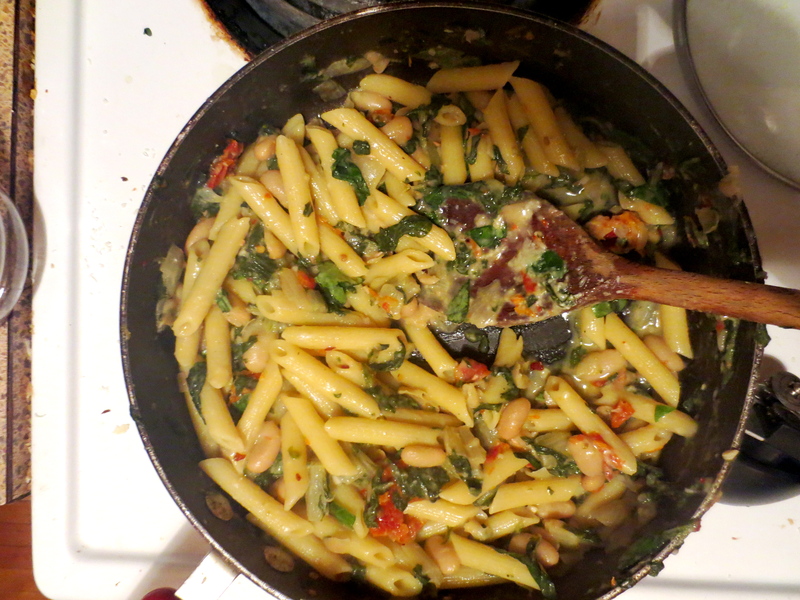 When the pasta is done and only a little liquid is remaining in the veggie pan, drain the pasta and toss it in with the veggie pan (off the heat), mixing in the parmesan (which should start to melt with the residual heat), sundried tomatoes, pepper flakes, and basil. Finish with a squeeze of lemon!